Welcome to Makani Sands Unit #206. This beautiful one-bedroom condominium surrounds you with traditional Hawaiian feel and decor in your own beachfront home by the sea! To make your vacation in Paradise effortless, there is a High Definition TV, DVD, CD player, and everything you might need for your vacation get-away! There is a brand new kitchen with all the amenities, conventional appliances and a microwave oven as well. Our beachside BBQ is a great place to meet other vacationers while grilling your fresh island fish. 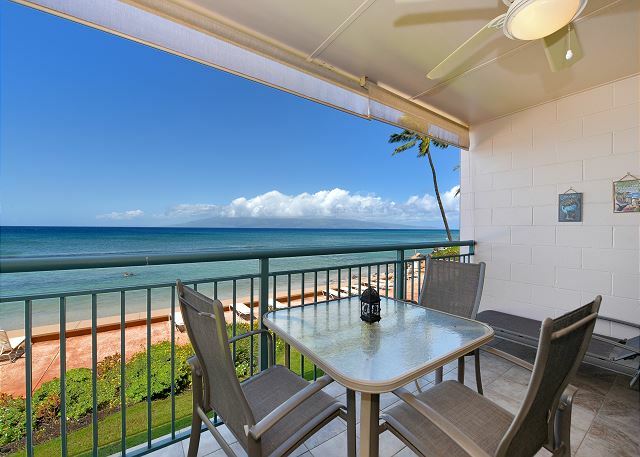 Dine on your private lanai while enjoying the spectacular sunsets over Molokai and Lanai, our neighboring islands!.. There is a king bed and a 2nd TV in the bedroom. There is a sofa bed in the living room for an extra guest! Newly remodeled bathroom with walk-in shower. Sunbathe on the lawn, snorkel off our beach or swim in the freshwater pool, all within a few feet of your door. There is also a SAFE for your valuables. Makani Sands was our favorite place of the 7 different places we stayed on Maui. It was quiet, clean, well supplied, convenient, friendly stall. Loved sitting on the deck watching the whales breaching, the turtles, and surfers. Would highly recommend it! Our unit was great! Owners had all extra amenities we could think of. Very comfortable....bed was perfect..and had everything we needed in the rental. Was very pleased. View was unbelievable!!! We had a great stay in the Makani Sands resort. The unit was nice and clean, tastefully upgraded, having everything we needed for our stay. The staff in the office was helpful, professional, and friendly. 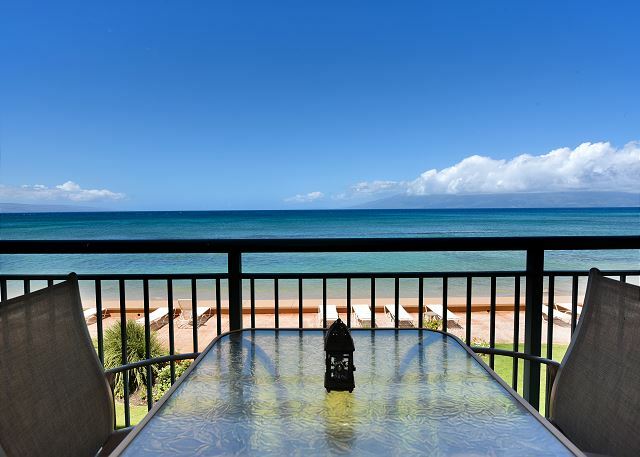 This resort has a great location, being close to various restaurants, grocery stores, and mainly to the beautiful Napili and Ka'anapali beaches. We are looking forward to return back again, and certainly recommending it to everyone looking for a clean and quiet place, having a beautiful ocean front view from the balcony. Our seven day stay at the Makani Sands was fabulous! The condo offers a beautiful ocean view. We enjoyed watching the gorgeous sunrises and sunsets from the balcony. We found the property to be very clean and the grounds well-maintained. Everything one could possibly need was provided from a well-stocked kitchen to a washer and dryer! The property manager was very friendly and courteous. We felt very much at home during our stay. The location is perfect, close to shopping malls and great restaurants. We definitely plan to return and would highly recommend this property to friends and family. Thank you so much for the warm hospitality. Mahalo! My 3rd stay at Makani Sands and I'll keep coming back! Love the quiet location, walkable to the Farmer's Market, Java Jazz, Fish Market, supermarket if you must. The condo had everything that we needed to come home to after beach and hiking days. Thanks for the snorkel gear and beach chairs, the plentiful wine glasses and kitchen stuff and the brand new jigsaw puzzle that made Tropical Storm Olivia just a rainy day. We had a wonderful time during our stay at Makani Sands. The place was exactly like the description--clean,fully stocked, bright, well maintained; the property itself is beautiful & also well-maintained. The facility was quiet at night, therefore it was wonderful to hear the waives at night, it was so soothing. Wonderful experience. Have stayed at Makani Sands several times and love it. Great view from the room. Only problem, need a tall table and chairs on the lani to see over the railing. We had a lovely vacation. The view was perfect! We felt so at home in our unit. I wish we didn't have to leave. What an incredible experience listening to the waves as we went to sleep. Another plus was having the washer dryer in the unit, along with full kitchen with everything we needed and beautiful bathroom. Can't wait to stay here again! A great home away from home. The condo was clean and provided everything we needed. We watched many whales and turtles from our lanai. Outstanding view! The staff, Marie and Bert were very knowledgeable and helpful. Love the sound of the crashing waves. Lanai railing is too high. Had to sit on pillows to see over it. Condo was adequate. Had enough dishes and pots and pans. Could use a coffee grinder. I bought one to use while we were there and brought it home with me. Bathroom has been nicely updated. Like having in room washer and dryer. Too many ghost ants running around on counter, although I believe this is a common problem on Maui. There was no there on weekends to clean up the sand and rocks the waves deposited on the patio area which made it very hard on the feet for walking. We are always so happy to stay at the Makani Sands it feels like our home away from home!! Everything went very smoothly and Marie communicated well with us, both before and during our stay. 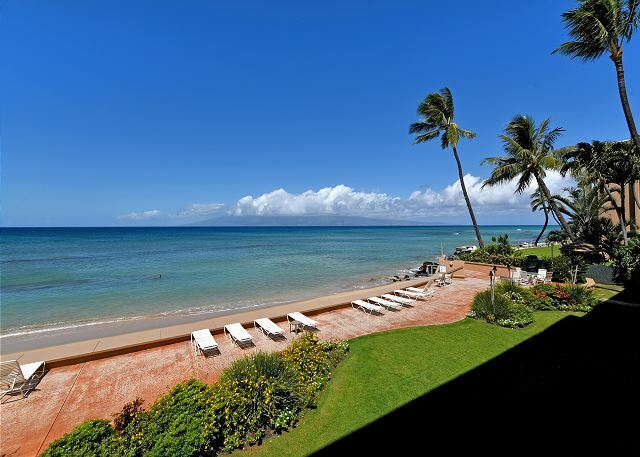 Makani Sands is a charming place, and we especially enjoyed our oceanfront view from the lanai. Great for sunrise and sunsets! This is a great place to stay ..there is a full kitchen, in unit washer and dryer and is very well as being right there on the beachouse with the big Turtles! Friends stayed in another unit and they had quite a bit more "extras", but this is the only negative I would say. a guest from Redding, CA does not recommend this vacation rental. I wont recommend staying here. There is no air conditioning and no windows just shutters. We have been vacationing at the Makani Sands for the past 20 years. It has always been a pleasant experience. Good location, right on the ocean, beautiful landscaping, and a very courteous staff. We enjoyed our stay at beautiful Makani Sands and especially loved our condo which had a beautiful view of the ocean. The condo was neat, nicely decorated and modern. 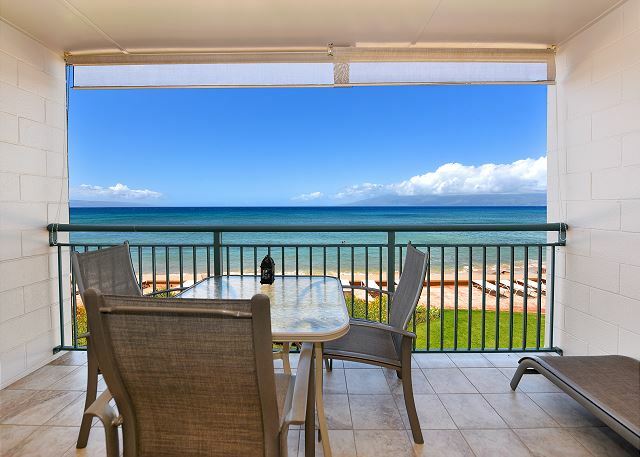 Great location This was our third time at Makani Sands but our first stay in this unit.We love the property beach front area and viewing from the lanai.We have enjoyed each visit here and will always come back to stay here when going to Maui. This unit 206 is in need of new furniture, the bed is worn out and gave both my wife and I a back ache and the couch was very uncomfortable as the kitchen ants would come from everywhere when anything was left on the counter for more then five minutes.But even with these problems we still loved our stay and hopefully everything will be corrected. We've been coming to Hawaii about every year since our 1979 honeymoon and over the past 15 years or so we've settled on Maui and Makani Sands as our favorite place to come, unwind and soak up the island beauty and hospitality. Unit 206 typifies the care that the condo's owners have taken to keep their units updated, attractive and comfortable. We've visited Maui many times and just love Makani Sands. Other places just don't compare: location, beach access, view, not so windy as other places on the island (just mild trade winds}, access to shops and stores, turtles, not a ten-story high-ries with people everywhere but more quiet and laid-back (our kinda' place), excellent attentive staff (available, friendly and helpful), very competitive rates (good bargin), clean units and manicured landscape. What else could one ask for? Makani Sands is in a great location. Makani Sands is a wonderful spot. Has its own very small beach for swimming. Condo unit could use some updating. We enjoyed our stay once again. Makani sand offer a home away from home comfort. Clean condo and Perfect for our 2 week vacation. Great location, view, beach. Lots of turtles and whales and lovely people. Will definitely stay here again. Everything was fine with the location and the apartment. Couldn't find a kettle, but we managed without!